A destination wedding requires a lot of careful planning. There are challenges at almost every turn. 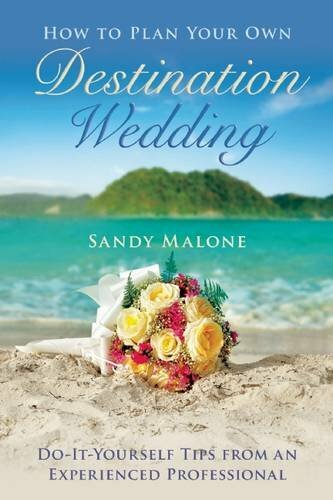 Luckily, Sandy Malone has written new book called “How to plan your own Destination Wedding” which clearly and simply guides you through them all. I talked with Sandy for some advice on planning a destination wedding. Sandy Malone has helped over 500 couples plan their destination wedding for 10 years. She know what she speaks of on anything having to do with planning a wedding. Her book is full of useful tips that you simply sometimes don’t think about. I really liked the easy and practical reading style. 1- Select a date and check with your VIPs to ensure that they can attend. Don’t book a venue and vendors only to find out that Dad is having surgery that day, or something. Once they have confirmed with you, then book the venue immediately. I’ve had this happen locally, where a bride has booked me and then changed the date because Mum and Dad are not available. 2- Research your destination well. It is important to know as much as you can. What entertainment and attractions are available for you and your guests. The location of the closest hospital is important to note. How late are bars open is important when friends and family gather. This information is equally important for a local wedding. Couples can produce an information package for out of town guests coming into your city. For example, the Lord Elgin hotel in Ottawa has a package that lists attractions available for guests. 3- Do not over schedule yourself and your guests. You and they have traveled to the destination. Having scheduled events one after another will exhaust you. You need to have time to rest. relax and savor the location. Your guests want to explore the destination on their own time too. Take something you do and transport it. For example if you are an avid skier, you could have a ski destination wedding in the alps. Find and island, any island. Often we think of a tropical island as a destination wedding locale. However, she is finding that you can find a closer location for less money and hassle. Jekyll Island in Georgia or the Thousand Islands in upper New York are easily accessible. I highly recommend Sandy’s book for ever bride and groom. The advice is focused on destination weddings. However, it is equally applicable for any wedding you are planning.